Fl. Cap. (Harvey) 6: 366 (1896). Accepted Scientific Name: Bulbine latifolia (L.f.) Spreng. Syst. Veg. (ed. 16) [Sprengel] 2: 86. 1825 [Jan-May 1825] Spreng. 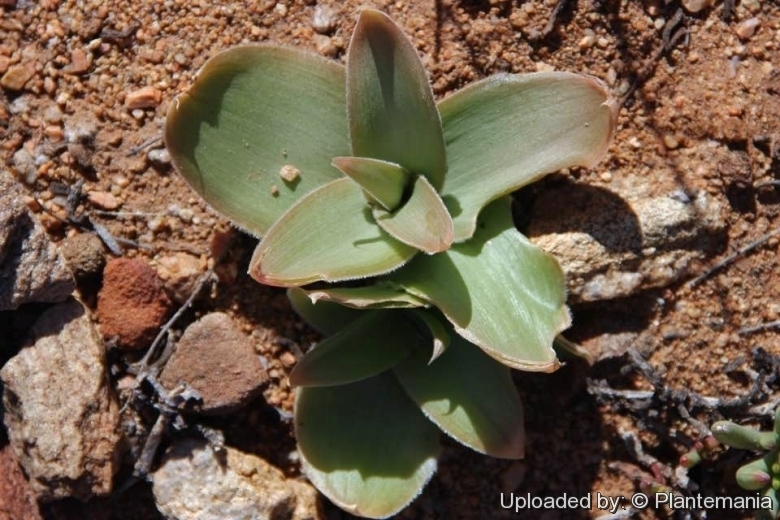 Origin and Habitat: Modderfontein, Little Namaqualand, North-West Cape Province, South Africa, South Africa. Altitude range: Around 450-600 metres above sea level. Bulbine latifolia var. curvata van Jaarsv. Description: Bulbine brunsvigiifolia (previously known as B. brunsvigiæfolia or B. brunsvigiaefolia) was first named in 1987 by J. G. Baker. It is generally included within (as a synonym of) Bulbine latifolia |SN|34294]], suggesting that there is not really a fundamental difference between the two, and hard to name accurately without knowing where they come from. The name brunsvigiifolia, meaning "Brunsvigia-like leaves", refers to the leaves that lie flat on the ground at the manner of Brunsvigia. The leaves distinguish this species from the other low growing species. Leaves: Thin, lorate-oblong (tongue shaped), 15-20 cm long, 5 cm broad, subobtuse, minutely cuspidate, glabrous on the surface, densely persistent, shortly ciliated on the edge. Inflorescence: Peduncle stout, a foot long; flowers many in a lax raceme 7.5-10 cm long; pedicels ascending or spreading, 12-18 mm long; bracts membranous, ovate-lanceolate, 8-12 mm long; perianth 12 mm long; segments oblanceolate, obtuse, distinctly keeled with green; stamens 3 mm long; filaments densely stuppose in the upper half; anthers small, oblong; style filiform, 4 mm long; stigma capitate.